Because the sun shines again and i am back! For the past 5 months, i had an unspoken feeling with my body conditions. I am honestly being suffered, but i don't even want to show people out there. What people need to know is i'm doing fine now. I am expert to be an introvert about this. 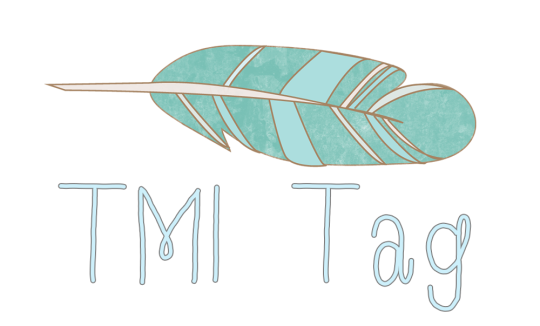 I was watching a few Youtube videos earlier about some "Vlogger" do the "TMI Tag". I have no idea what it is until i *Google-ing* it and oh i see, TMI stands for "Too Much Information". You just have to answer 50 random questions. I was wondering what if i do the TMI tag but in my blog (because i don't vlogging). Is anybody want to know about me? i don't think so. Like, no one cares that much, maybe. hahahaha just to make some FUN. * i'm wearing purple t-shirt and short (i'm not wearing my hijab because i'm in my room). 3. Have you ever had a terrible break up? * around 40 kg. I don't like if someone ask me about this. Like, "why are you so skinny?" or "What's wrong with your body?" or "eat a lot". Something like that. and you know, i really want to punch their face. * No, and never ever want to. * i only use earrings when i was a kid. * One of my fav OTP is Ron Weasley and Hermione Granger. Who doesn't love them? <3 childhood best friend getting married. 9. What is your favorite show? * ANTM, Masterchef, Dexter, Return of Superman, Running Man, and Korean drama lol. 10. Who are your favorite bands? * I don't have any favorite bands, i just like some of their songs. * i miss my long hair, i miss surprises, and i miss my friends. * right now, Justin Bieber - Sorry. * 28 years 12 days lol. * 90% Taurean. Dat stubborn. geez. * Body like Lee Min Ho, face like Zayn Malik, and maybe I'm just delusional. * "and you're the place my life begins, and you'll be where it ends." 17. Who is your favorite actor? * Ryan Gosling on The Notebook, Andrew Garfield on Spiderman 2, and Chord Overstreet on Glee. * pink! lol. i know i'm 28 but pink is always the cutest. Esp. Fushia. * depends on the mood, mostly soft. * i stay exactly where I am. When i'm home i'll spend my gloomy day in my room, alone under the blanket, try to sleep. * 5 minutes without hair treatment. 22. How long does it take for you to get ready in the morning? * around 30 minutes. I do my make up while breakfast, multitasking needed in the morning. 23. Have you ever been in a physical fight? * i don't remember but i think i have ever been in a physical fight when i was in elementary. gangstah. * funny, friendly, warm, and play guitar or piano. * smelly, talk too much, care too much, all that "too much". 26. The reason you joined the blogging community? * i just want to share my thoughts rather than just having them enclosed in my diary. 27. What are your fears? * being rejected and losing someone. * seriously i don't remember. It's like million years ago. 30. Meaning behind your blog name? * because i like "deer" and "dania" is my precious middle name. So, i choose "deer dania" instead of "dear diary". 32. Book you're currently reading? * right now i don't read any book. * Asia's Next Top Model on Star World. 36. What is your favorite food? * sambel goreng kentang and mom's dish when Eid Fitr. * Senggigi, Lombok, South Korea, Disneyland, Paris, turquoise beach all around the world. * Chad Michael Murray. I use his name as my very first email. You know, "mychad". * my family i think, because that's my birthday. * A month ago when i went to dentist. Insulting people is like a joke for mr/ms perfect. 42. Favorite flavor or sweet? 43. What instruments do you play? * unlucky me i don't play any instruments. 44. Favorite piece of jewelry? * rings. wedding ring maybe. * i don't do sport, at all. * Adele - All I ask. 47. Favorite pick up line? * of course. every time i feel down. * i went to amusement park and had so much fun. Yippiiieeee! * all of you who read this! Whoaaaaa. i finally did it. Next is your turn!